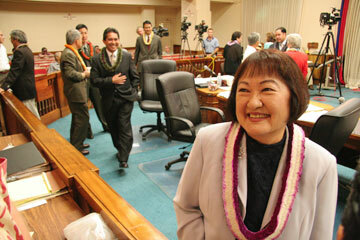 City Councilwoman Ann Kobayashi chatted with the news media yesterday while the rest of the City Council milled about. Kobayashi offered a last-minute compromise that would have attached the North-South Road leg of the green line to the yellow line. Kobayashi ultimately withdrew her proposal, negating the need to recess until Tuesday. The City Council, in a 7-2 vote yesterday, gave final approval to a fixed guideway mass transit system for Oahu but left it to Mayor Mufi Hannemann to decide key segments of the route. » The City Council approved what is called a "locally preferred alternative," necessary under federal funding requirements. 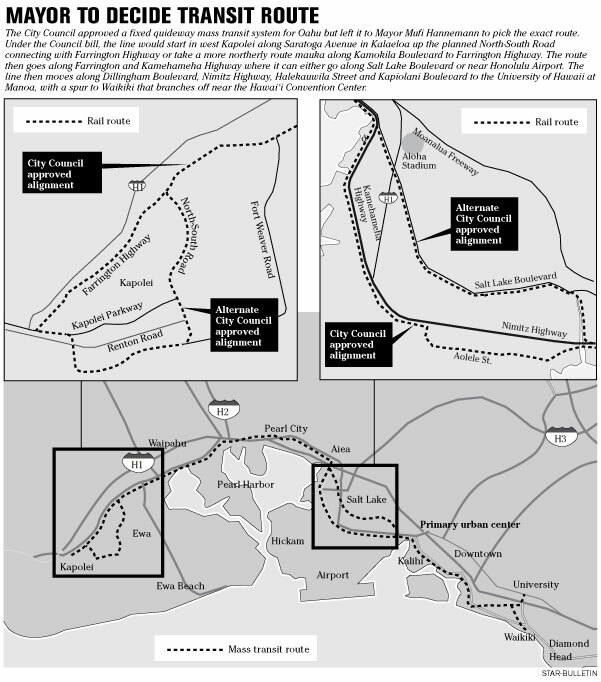 The Council selected a mass transit alternative -- fixed guideway with the possibility for rail or buses -- and an overall route from west Kapolei to the University of Hawaii at Manoa, with a spur to Waikiki. » Mayor Mufi Hannemann's administration will determine within the next month which alignments to choose in West Oahu and in the Salt Lake and Honolulu Airport area. The administration also aims to decide by February which segment of that overall route to construct first, and will send that recommendation to the City Council for approval. The Council settled the debate between the so-called green and yellow alternative lines in West Oahu by designating that both should be considered for a route that will run from west Kapolei to the University of Hawaii at Manoa, with a spur to Waikiki. The route is at least 28 miles long and has a minimum price tag of $4.6 billion, but no final numbers were available. The Council punted to Hannemann's administration to decide whether one or both lines should be made part of the overall transit route. The green line, supported by the Hannemann administration and community leaders in Kapolei, Ewa and Ewa Beach, is proposed to run from Kapolei along Saratoga Avenue in Kalaeloa up the planned North-South Road connecting with Farrington Highway. Supporters said the green line provided the best financial, ridership and economic development potential for transit while also directly serving Kapolei and Ewa residents. The yellow line, which the Council's Transportation and Planning Committee favored going into yesterday's meeting, would take a more northerly route, mauka along Kamokila Boulevard to Farrington Highway. Supporters of that route said it is a straight shot into town, while opponents said it would not directly serve Ewa Beach residents and several critical housing, commercial and other developments such as the Kroc Community Center. Councilman Todd Apo, who represents most of West Oahu and who introduced an amendment for the green line, credited the Kapolei and Ewa communities with voicing strong support. "The yellow route was a surprise to them. When they realized that was an issue, they came out and showed why the green route was the best bet," Apo said. "Someone was asking the other day, 'Does testimony make a difference?' I think it did today." The Council also voted to let the Hannemann administration decide another controversial portion of the route: whether the line should pass through densely populated Salt Lake or by Hickam Air Force Base, Pearl Harbor and Honolulu Airport, or both. The Hannemann administration has favored the airport route because the ridership is estimated to be higher due to the number of jobs generated by its job centers. "I believe that Salt Lake stop, the condo area, is something worth looking at, and so keeping that alive is an option," Apo said. Councilmembers Romy Cachola and Rod Tam talked yesterday with city Managing Director Jeff Coelho. The fixed guideway system allows the administration also to decide whether rail or buses should be chosen to carry passengers along an elevated structure. The mayor, who strongly favors a rail system, was delighted with the vote. 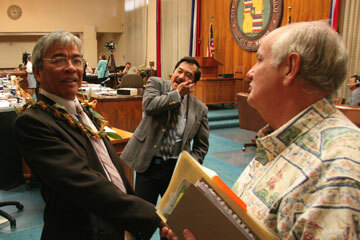 "This is probably the best Christmas present that one could've asked for in 2006," Hannemann said moments after hugging Councilmen Nestor Garcia and Rod Tam, who along with Gary Okino, Todd Apo, Ann Kobayashi, Romy Cachola and Donovan Dela Cruz voted for approval of Bill 79. Councilmembers Charles Djou and Barbara Marshall voted against the bill, mainly because they believe the city will not be able to afford it. "I hope Santa Claus is coming with a lot of money for Honolulu Hale on Monday," Djou said. The vote nearly did not take place yesterday. Earlier in the day, the Council voted 5-4 to recess until Tuesday, which would have delayed the vote by four days. The decision to recess came after Kobayashi offered a last-minute compromise that would have attached the North-South Road leg of the green line to the yellow line. "So we take care of the concerns of the Ewa people," she said. Her proposal raised procedural questions about whether the Council could vote on her amendment yesterday. But Kobayashi's plan also meant that the Saratoga Avenue portion of the green line through Kalaeloa would not be built unless money were available. That set off a firestorm reaction from West Oahu residents who wanted the full green line and wanted the vote to be taken yesterday. "Let's do it," Ewa resident Tesha Malama yelled from the audience as the Council was deciding to put off the vote. "The public is here." Damani Montgomery and Kai Szostak, on a field trip from Moiliili Hongwanji Preschool, looked on before the meeting. Kurt Favella, chairman of the Ewa Neighborhood Board, testified that not going to Kalaeloa would hurt homeless families and veterans living in that area. The green line "would help them get into town, into their doctor's appointment." He and Kobayashi got into a rapid-fire exchange, at times talking over each other. "When we voted on this, we voted on the green route and not chopped up, trunk here and alignment there," an excited Favella told Kobayashi. "It seems like for me, I'm not confused, I'm positive on this route, but what you're trying to do to the communities out there is confuse us, and it's not going to work." By late afternoon Kobayashi had withdrawn her proposal, negating the need to recess until Tuesday. She said after the meeting that she had floated her idea to community members before introducing it yesterday and had received a favorable response, so she was surprised at the reaction from the community. "I'm not one to push something on a community. I was trying to help them," she said. Hannemann noted, "I think the City Council knew too that it was democracy in action. People came out and said they wanted a decision." The mayor said his administration would re-examine the different lines and decide between the green and yellow lines and the Salt Lake versus the airport segment. "They really want us to look at it, and we will," he said. "Certainly it's going to present an opportunity to revisit our previous decision, which was basically we felt it's best to go to the airport and Pearl Harbor, and it was best to go with the green route." Hannemann said the federal funding process requires the study. "I want to hear from the experts. I want to hear from the engineers. I want them to verify what I feel instinctively, and certainly we'll see when that analysis is done whether in fact my previous disposition still stands." The administration is also aiming to designate the route's first phase, or the minimum operable segment, by February. The earliest the first phase of about six to 10 miles could be operable would be 2012, according to Hannemann's administration.